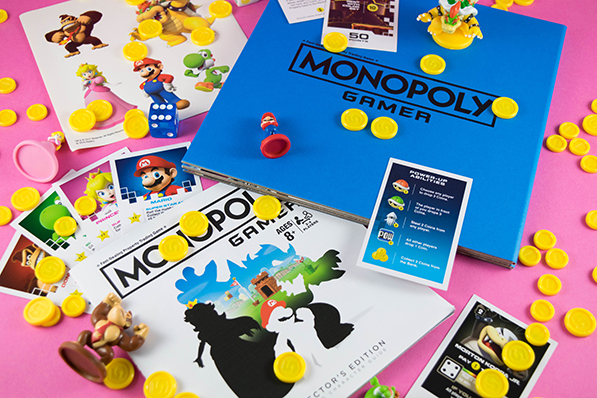 Monopoly Gamer is Like Mario Party Come to Life | YAYOMG! 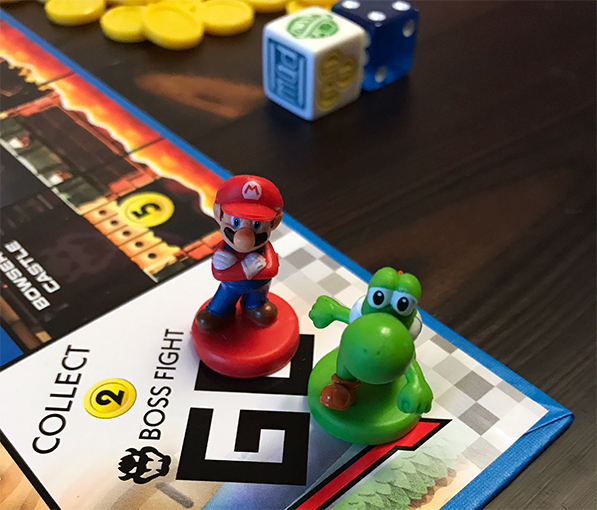 There’s few things we love more than kicking back and enjoying a round of Mario Party with our friends, but wouldn’t it be cool if you could take that experience to the table in a real life board game? 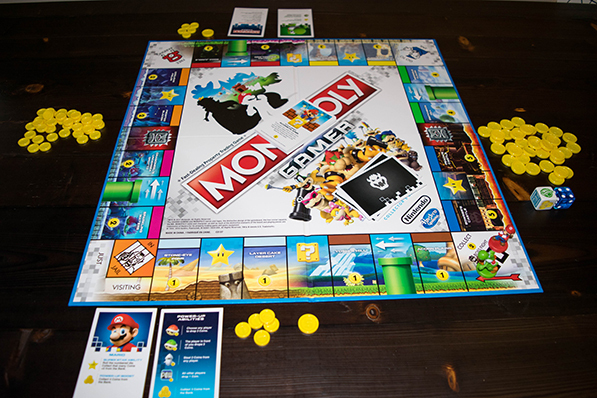 Monopoly Gamer does just that by taking the fun of Mario Party and combining it with the classic elements of Monopoly. 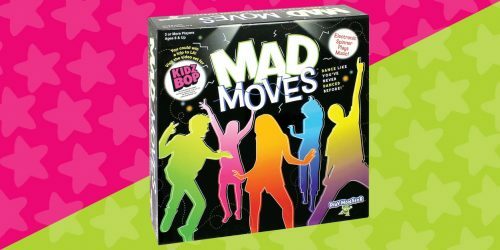 Sure, there’s no crazy mini-games to play or the chaos of stealing stars from each other, but this is definitely an extremely fun board game experience. 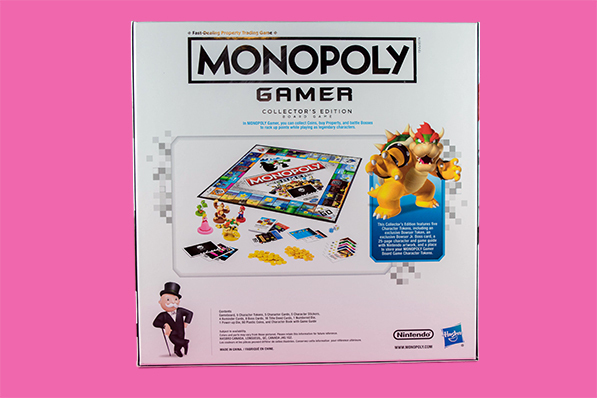 Monopoly Gamer will officially hit toy stores in August, but Collector’s Edition is out now at GameStop. We picked up a copy of the Collector’s Edition because we’re Nintendo fangirls and couldn’t possibly wait another moment to try it out. Here’s what our experience was like playing the game for the first time and what’s inside the box. If you’re a big Nintendo fan, this version of the game is totally worth it. 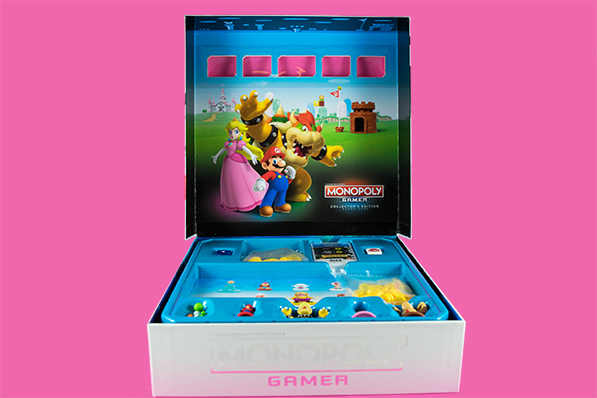 The box is super durable and features awesome Super Mario artwork printed both outside and inside the walls the box. Now, onto the game itself. 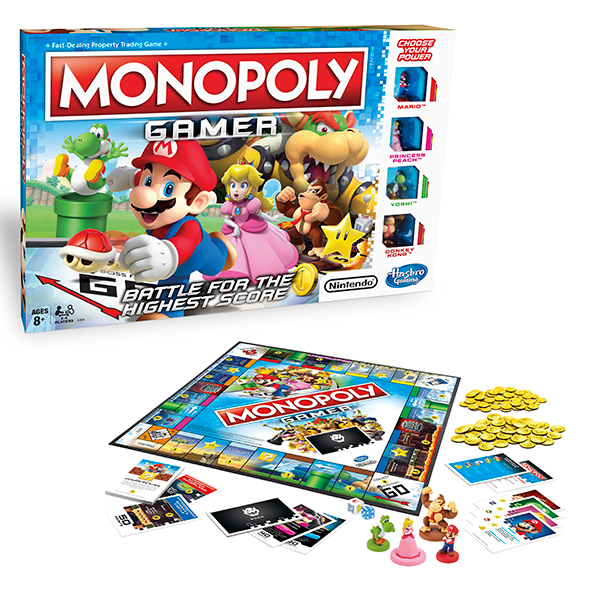 At first glance, the game looks a lot like Nintendo Monopoly, which had us worried. We’re bored to tears by the regular version of Monopoly (it takes SO. LONG. to play! ), but we’re happy to report that Monopoly Gamer truly brings the fun. 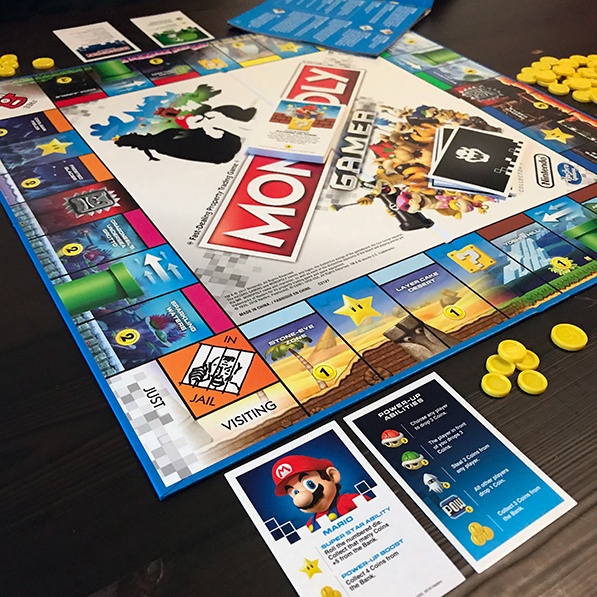 It combines the fun parts of Monopoly with some classic Mario moments, like throwing a Red Shell, collecting coins, and traveling via Warp Pipe. Most importantly, you’re playing for high score, which adds a really fun, competitive element to the game. It’s not always about who has the most money at the end of the game, but also who has the best luck in a boss battle, who buys up the most properties, and how the game twists and turns as you play. The choices you make affect the game in a really fun way, making this a much more engaging experience. Even with the learning curve of our first time playing, it only took us an hour to complete a 2-player game. A much more digestible burst of gaming than those days-long Monopoly games that the cat inevitably knocks off the table and ruins for everyone anyway. Setting up the game is pretty easy. 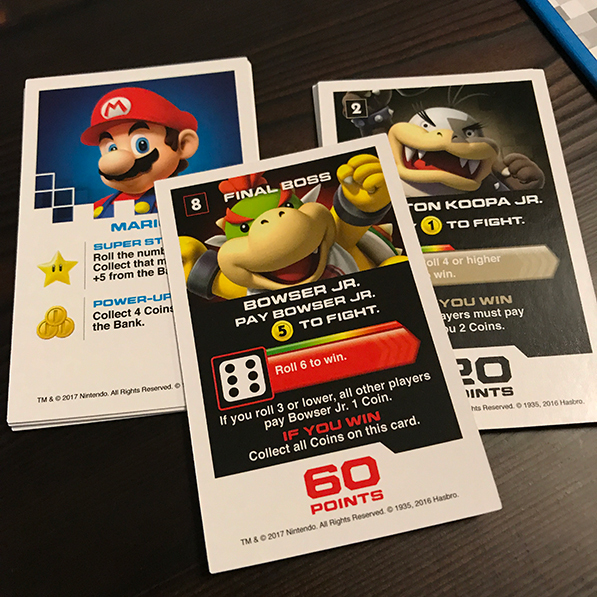 Separate the single coins from the 5 point coins, pile up the boss cards in their proper place, lay out the property cards (or keep them in a stack like we did), choose your Nintendo themed game token, and get ready to play. 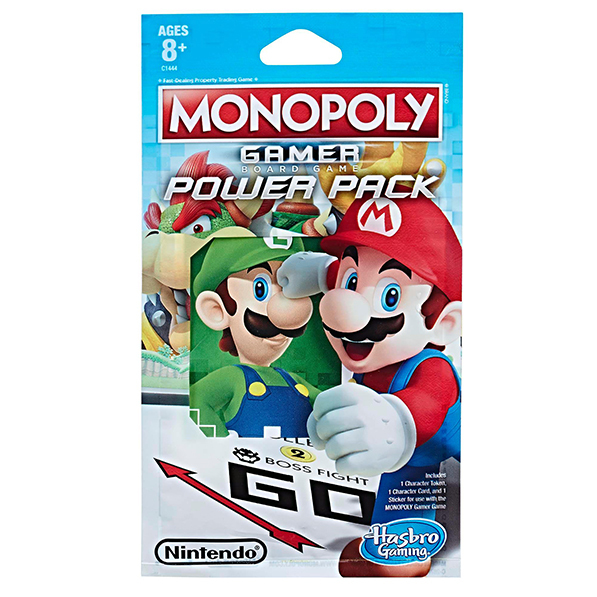 Both versions of Monopoly Gamer come with Mario, Yoshi, Peach, and Donkey Kong. 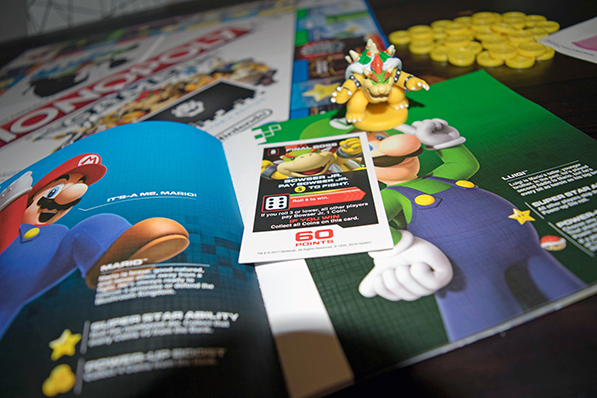 If you have the Collector’s Edition, you’ll also get an exclusive Bowser character. They suggest that if you’re playing a 2-player game that everyone play with two characters instead of one to keep things interesting, but since we were focused on just figuring out how to play, we stuck with just one character each. We can definitely see why you’d want to add in additional characters, though, so we’ll definitely play that way next time. Each player also gets a character card showing off their Super Star Ability and Power-Up Boosts (these vary depending on which character you choose) and a Power-Up Reminder card, which basically just reminds you what each icon the Power-Up die means in case you forget. For Example: Mario’s Power-Up Boost is being able to earn 4 coins instead of 3 when you roll a coin block, which helps keep him in the lead when it comes to cash. Or does it? We played against Yoshi, who’s able to scoop up ALL the dropped coins anytime he lands on a Power Star, so it definitely keeps things balanced and intense. That’s it, you’re ready to play! There’s no Chance or Community Chest in Monopoly Gamer. Instead, the action squares have been replaced with Thwomps, Power Stars, and Warp Pipes. As you round the board, you’ll discover lots of other differences from the Monopoly you’re used to. You can buy properties for coins, but there’s no houses or hotels to place on them. 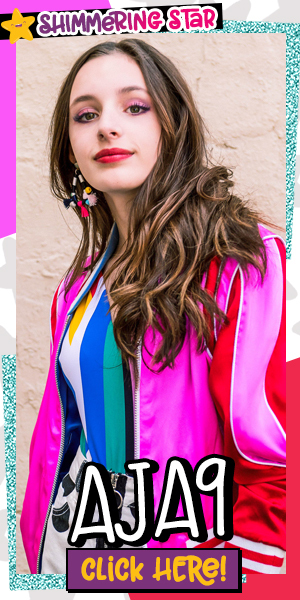 Instead, each property has a point value that adds to your score at the end of the game and there’s a color bonus for owning both colors of a property. 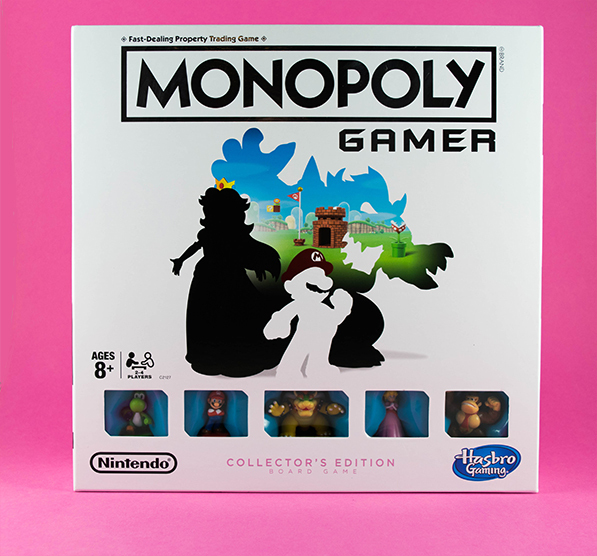 That reminds us, this game board is smaller than a typical Monopoly board, and is more in line with Monopoly Jr., as there are only two of each color property available instead of three. This really helps move the game along. Another thing that keeps things moving is the addition of all the power-ups and actions that happen throughout the game. On each roll, players roll both numbered and Power-Up dice. You can choose to make your move and then play your Power-Up or the other way around, it’s up to you. We found that playing the Power-Up ability first ended up working in our favor most of the time. The Power-Ups provide constant action that’s really missing in a typical Monopoly game. There’s a constant flow of coins being exchanged between players, the bank, and the game board at any given moment. We love that players sometimes “drop” coins on the board, because it’s just a very Super Mario thing to do. When coins get dropped around the board, the next player to land on or pass them gets to pick them up. Yay for free coins! This is the most Mario Party-esque thing that happens during the game and it can get super exciting as players with high scores are fighting to stay on top of the leaderboard. The Collector’s Edition adds a Bowser Jr. boss fight into the mix, which is by far the most intense, yet rewarding of the bunch. All in all, this game is much easier to play than Monopoly and much more fun. All the added “video game” elements really make the game extremely fun to play. We can definitely say that we’ll be playing this one again. And since this is all gaming based, Hasbro has added ways for you to Level Up the way you play. 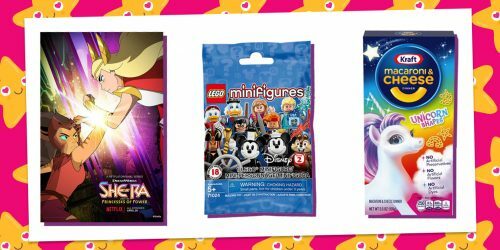 This comes in the form of “Power Packs”, which cost $2.99 and contain additional character figures and abilities. The different combinations of Power-Up Boosts and Star Power Abilities make the game different each time you play, giving you a brand new experience. 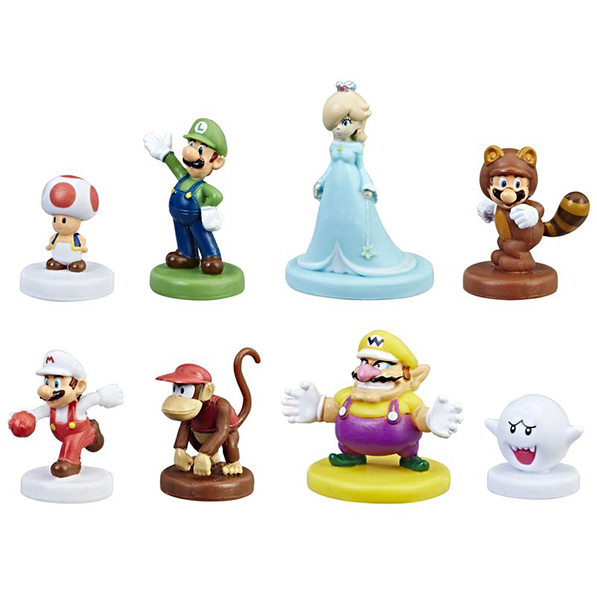 The additional characters include Rosalina, Diddy Kong, Boo, Toad, Luigi, Fire Mario, Wario, and Tanooki Mario. Ready to play? If you’re in NYC, you can head to the Nintendo Store to grab a copy of the game. Otherwise, you’ll have to hit up GameStop until the game fully releases at more retailers in August. The regular version costs $24.99 and the Collector’s Edition is $39.99. 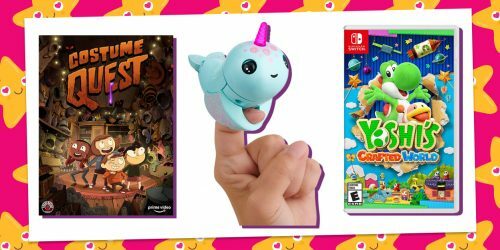 If you love gaming as much as we do, we think you’ll love these great games!